In 2000 my wife and I decided to move from the city to the Lowveld bush. Being “rookies” we were extremely excited to be going to work at a lodge in the bush and for the fantastic lifestyle the job entailed. At the time I had no intentions of being a photographer, and photography was not foremost in my mind! The only camera I owned was an old Vivitar 110 film camera that had lain in my cupboard, without a film, for years! One afternoon after dropping off my guests I drove the “scenic ” and less travelled road back home to the lodge, and at a junction in the road I saw a silver package lying in the road. I got out and picked it up. It was a roll of film! Un-opened and waiting for me! I raced home to see if the film would match my camera and by a sheer stroke of incredible luck, it did! Now I had a camera with a new roll of film and I was set to take pictures. I imagined the cover of National Geographic graced with my images, I could hardly wait to take my new guests out on Game drive to put my new found photographic skills to the test. Within a few days I had taken all 36 exposures on the film and I rushed off to Hoedspruit (the closest town) to have my film developed. After a few hours of waiting in town I returned to the local lab only to be told that I had NO images on my film I was told everything was completely Overexposed and all I got was pure white on the entire film. Only much later did I realise that the sun had completely ruined the film as it was lying in the middle of the road. Undeterred I bought my first ever roll of film and headed back to the lodge and the next game drive to go and take some award winning images! And the rest, as they say… is history. I was completely hooked! I had a immediate love for photography and a burning desire to take the best possible Wildlife images the world had ever seen. I set about buying books on photography from numerous well known South African Wildlife photographers hoping to learn their secrets. I watched National Geographic TV and BBC Wild for inspiration. And I think I completely drained all the knowledge of any guests visiting the lodge that had a camera and a keen interest in photography. 13 years on, and only a few things have changed. 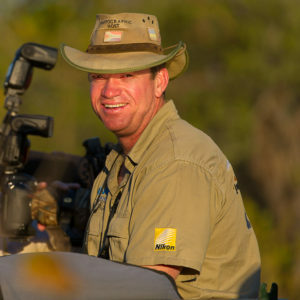 I now have many years of bush and photographic experience, numerous photographic achievements and accolades as well as seeing my images in print all over the country. Undoubtedly the top photographic highlights for me over the last 13 years has been a “Highly commended” image in the Natural History Museum and Veolia Wildlife photographic competition in 2010 and my “Runner up” Image in the Black and White Category in same competition in 2013. One of the top Wildlife photographic competitions worldwide hosted by the Natural History Museum in London every year. I have also upgraded my camera gear a few times since the Vivitar 110……. My wife has now learned to ignore me when I say "I only need one more lens or one more camera body and then that’s it". She has long since learnt that upgrading lenses and cameras seems to be part of Wildlife photography. My love and passion for wild places and taking photographs is still the same as my very first game drive with Vivitar 110 and Sunburnt film in hand. BBC Wildlife photographer of the Year 2013 Runner up in the Black and White category Called "Shot in the dark" BBC Wildlife Photographer of the year Highly commended for 2010 in the Mammal Behavior category with this image called "Lion and his little Nipper"